What is a honeymoon registry and how does it work? How much china, bedding and electrical appliances do you really need? Our honeymoon registry offer the Bride & Groom’s family and friends an alternative to give them a wedding gift? It is with great pleasure that we have this opportunity to introduce one of our Personalized Services International Travel Agency’s featured programs: The Honeymoon Registry Gift Program. The special part shouldn’t end at “I do” and our Romantic Travel Experts know that. While helping to make Jonah Patton and Kalani Boyd’s dream honeymoon a reality, we can also provide their family and friends with the unique opportunity to designate $25, $50, $75, $100 or more towards their honeymoon registry – wedding registry. If you’re looking for a unique way to say “I do” while surrounded by your closest friends and family members, a destination wedding in a romantic location is ideal. Having a destination wedding allows you to exchange vows in a stunning paradise. Whether you envision your ceremony on a white-sand beach, atop a cliff overlooking the ocean, within a botanical garden, or surrounded by the beautiful Hawaii scenery or French Alps Mountain Vacation, the options are limited to your imagination and financial situation. We can plan a destination wedding to fit your budget and destination. We plan Destination weddings that range from the luxury 5 star resorts around the world or close family events that are intimate and there are endless options to fit all budgets. 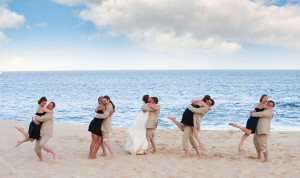 Destination Weddings on the beach is fun and exciting. Destination weddings allow couples to have intimate celebrations with just a few guests or a larger wedding with as many as 100 to 200 friends and family members. A destination wedding allows you to spend quality time with your guests in a relaxing setting over three or four days for the wedding and it allows you to extend it right into your honeymoon. Destination weddings are less expensive for couples than traditional weddings because guests usually pay for their own travel and accommodations. Attendees of the wedding also get a vacation with attending the wedding at a romantic location. This is a WIN-WIN situation for guest that are married or traveling as a couple. Destination Weddings for the Bride and Groom can be paid for with our Honeymoon Registry as well.